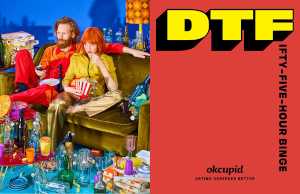 Dating app OkCupid recently launched a new marketing campaign centered around the popular yet derogatory dating phrase “DTF,” but giving it new meaning in the age of #MeToo. The campaign is also a dig at Tinder, which is known for its hook-up reputation. Instead of employing DTF with its usual meaning (which is widely seen as demeaning to women and refers to Down to F@#k), OkCupid has turned the term on its head to engage people to try the app. For instance, one campaign poster defines it as “DT Fall Head Over Heels” with a picture of one woman lovingly carrying another who is holding a rose (the symbol of romance). This nod to inclusivity for the LGBTQ community did not go unnoticed, with couples recreating the shot next to OkCupid’s campaign posters and posting them to social media. OkCupid hasn’t done huge marketing spend like this compared to other apps like Tinder, although the irreverence of this campaign is particularly on-brand for OkCupid. The app engages its users by prompting them to ask and answer questions when they join, rather than just searching through profile pictures. Some folks aren’t very happy with the ads, and have fought against displaying them altogether. OkCupid introduced the campaign in New York with no issues, but when it tried to buy space in Chicago they were told that the campaign was banned by the CTA, Chicago Park District, and O’Hare International Airport. According to the Chicago Reader, “a spokesperson for the CTA said the transportation agency rejected the ads because they violate its advertising policy, which prohibits ads containing profanity.” OkCupid argues that they were trying to “redefine” the phrase and were disappointed in the city’s snub. "This campaign unashamedly reconfirms what we believe: that dating deserves better," Hobley told Chicago Reader. "We're proud that OKCupid is one of the only dating apps that truly reflects back what is happening culturally, and we felt a responsibility—and opportunity—to play a part in changing the conversation about dating culture and empowering each individual to expand the meaning of DTF in a way that reflects what they want from dating." For more on this dating service check out our OkCupid App review.